Hot cross buns are a staple around Easter time but not everyone enjoys the traditional spiced bun filled with currants or raisins. So, we are providing you with 9 ways to shake it up a bit and try a new way to enjoy a hot cross bun. Let us know if you try any of these! We have also provided some hot cross bun recipes if you’re wanting to bake the whole thing from scratch. Bread sauce is a staple for many household’s roast dinners so why not use some hot cross buns to add something a little bit different to a Sunday dinner over Easter! 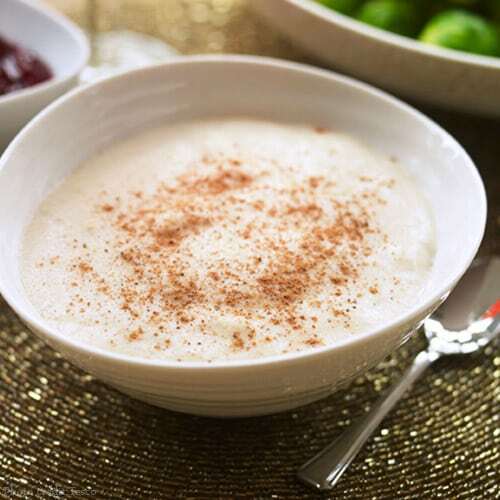 Biffen’s Kitchen have put together a simple and easy recipe to combine those mixed spiced flavours into your traditional bread sauce. Another easy but simple twist on a classic hot cross bun. This also works for left-over and slightly stale hot cross buns as you’re adding moisture with milk and if you’re like us and love a bit of indulgence, added custard will also make this deliciously soft. Tesco’s Real Food have used a simple recipe of hot cross buns, butter, chocolate chips, eggs, milk and sugar. 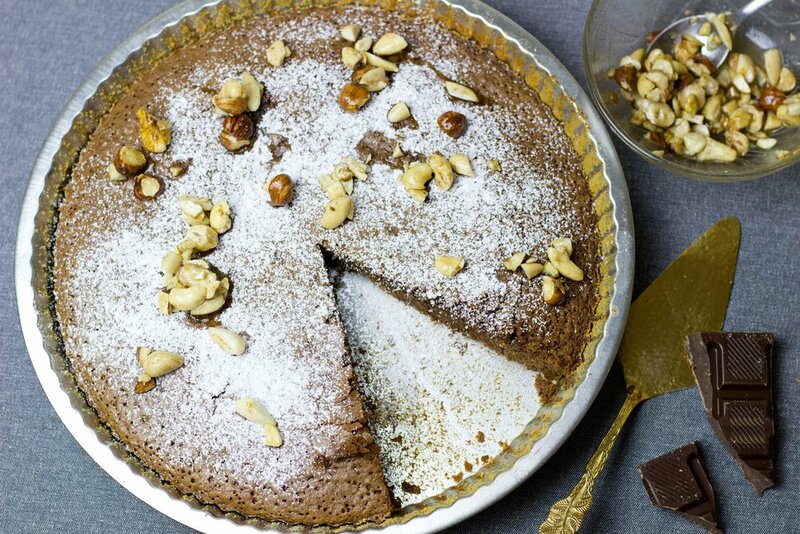 A quick and easy way to curb those sweet treat cravings. BBC Good Food combine hot cross buns and the traditional fresh toast to make an extremely yummy combination. Top with maple syrup, ice cream, bacon or fruit and this will not disappoint! This is also a fabulous way to use up those left-over hot cross buns as this recipe helps to bring moisture back into the bun. This is a great way to use up those left-over, slightly stale hot cross buns and also make something delicious and slightly different. Sainsbury’s have provided an easy recipe which serves the whole family. It used ready rolled pastry and an easy to make filling. Now, this is quite a new one on us but actually makes a lot of sense! 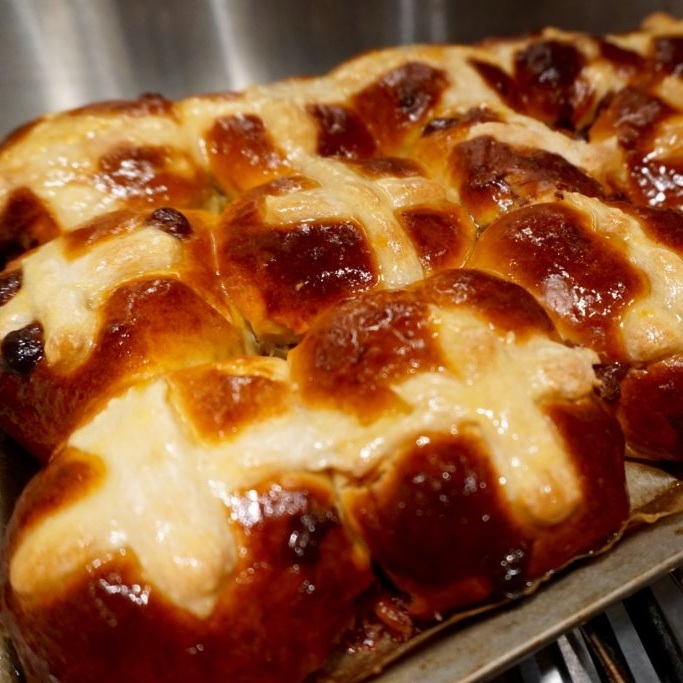 Replace your sweet brioche bun with a tasty hot cross bun. Woolworths TASTE have put together a delicious recipe including Korean BBQ flavours and a spicy coleslaw. This could be easily adapted by your favourite burger filling, whether it’s crispy southern fried chicken topped with cheese or grilled halloumi with chilli jam. Sainsbury’s have added a twist to your standard hot cross bun by making it into a waffle mixture! These would be perfect for a Sunday brunch or afternoon sweet treat. These are also very versatile as you can alter the toppings for your preference. Hot cross buns + cake, what could be better? 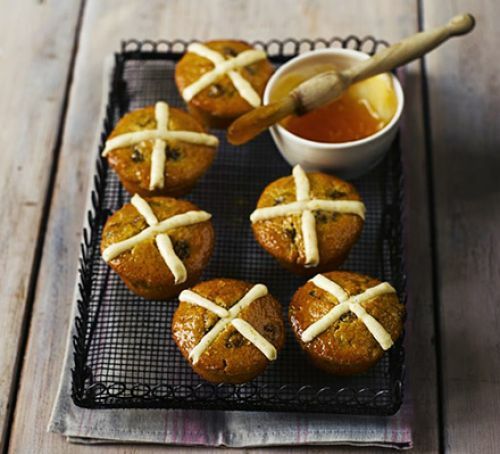 BBC Good Food have created hot cross bun cupcakes, combining the delicious flavours of lemon juice, mixed spices, raisins and apricot jam. If you’re not a fan of raisins or currants then switch them out for chocolate chips or caramel nibs! These cupcakes are great for a family bake with the kids too as it’s easy and simple. 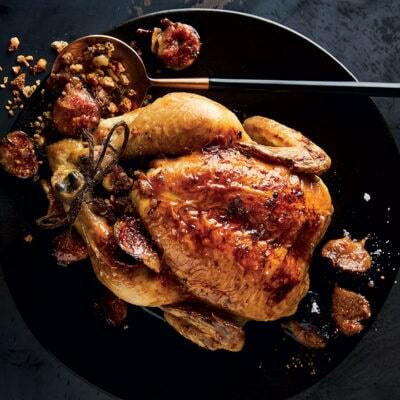 Another recipe from Woolworths TASTE uses hot cross buns for a stuffing. They add thyme, walnuts and figs to the hot cross bun mixture to create a lovely, fruity stuffing for your chicken. This is something a little different if you wanted something more savoury! This recipe essentially sandwiches rhubarb cheesecake filling in between two halves of a hot cross bun, how scrumptious does that sound? The rhubarb can always be switched out for another seasonal fruit, cranberries would work really well with this recipe. Feeling fancy and want to make your hot cross buns from scratch? Well, here are some delicious recipes for you to try! Salted caramel buns with chocolate chips just sounds too good to pass up on! Miss Pond’s recipe is a great alternative if you do not enjoy the mixed fruit/raisins in a traditional hot cross bun. 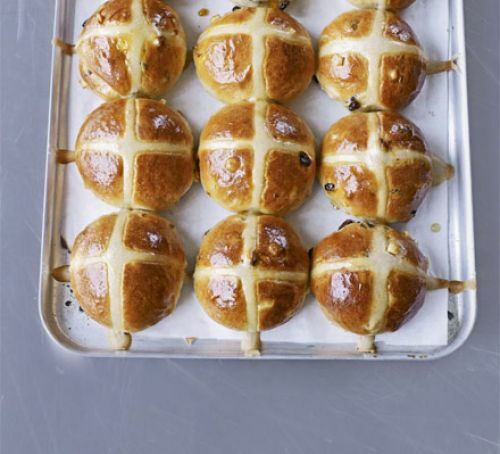 BBC Good Food have shared Paul Hollywood’s traditional hot cross bun recipe, combining sultanas, mixed peel, cinnamon and apple and topped with an apricot jam glaze for a delicious Easter treat (or any time of the year!). Jamie Oliver’s recipe doesn’t stray away too much from your traditional hot cross bun but does add extra yummy-ness by adding chocolate chips! This recipe does still use raisins but you can swap these out for even more chocolate chips. Interested in purchasing our hot cross buns? We make hot cross buns filled with currants and sultanas and we can also do a chocolate version! Our NPD team are always open to trying new flavours and combinations if you have one in mind. Get in touch with us on salesforce@fostersbakery.co.uk or Tel: 01226 382877 for enquiries. *(Please note we do not sell to retailers so you will not find our products in supermarkets).